Mitsuoka is known for some rather, let’s say interesting cars. Typically they are body kits for existing Japanese cars. To celebrate the company’s 50th anniversary, it has created its best-looking car yet: the Rock Star. Autoblog unearthed the Rock Star on Wednesday. The formula is fairly simple. Mitsuoka completely customizes a current ND-generation Mazda MX-5 Miata to turn it into a miniature C2-generation Chevrolet Corvette Sting Ray. The company doesn’t explicitly say it looked to the American sports car for a design direction, but the similarities are uncanny. The overall shape is truly one of a Chevrolet Corvette Sting Ray with raised flares above the wheel arches, a small chrome strip at the front, and taillights that are dead ringers for those of a C2 Corvette. Only the small fixed headlights give the car away at the front, and it reminds us that pop-up headlights are sorely missed. The car even has the C2’s banner trunk line where a “Corvette” emblem would typically sit. Although the exterior is totally redone, the interior is nearly all standard Mazda gear. Mitsuoka has only swapped out the leather trim and added a new badge on the steering wheel. Otherwise, any Miata driver will feel right at home. The same can be said for the powertrain. Mazda’s 1.5-liter inline-4 engine is still present. It sends a modest 132 horsepower to the rear wheels. A 6-speed manual or 6-speed automatic transmission are both offered. 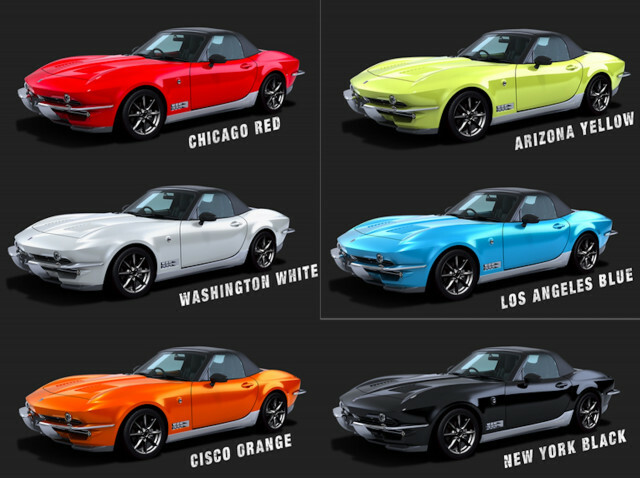 Keeping with the American theme, Mitsuoka has come up with some properly American paint hues, too. The company offers 30 paint colors, many with names playing off American cities and states. Examples include Los Angeles Blue, Chicago Red, New York Black, Cisco Orange, Washington White, and Arizona Yellow. The Japanese customizer plans to build 50 Rock Stars at least initially, and each will run the equivalent of about $41,000. They’re only offered in Japan, though, so don’t expect to see one here unless some crazy collector decides to import one. See you in Vegas next week! Is Smartphone Innovation All Tapped Out? Join the Honor 8 incentive program to earn prizes, discounts and more!